A new study by Psychtests.com reveals that a lack of autonomy and job control at work can be a contributing risk factor for burnout. Without a certain degree of autonomy and job control employees may feel more stressed, which could lead to burnout. Keeping employees in the loop is essential to their job satisfaction and mindset. Some employees thrive on structure and routine, and prefer to have the details of their roles and tasks clearly outlined. 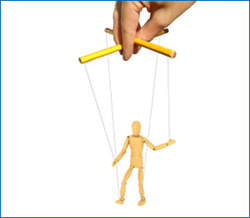 However, preferring to follow rather than lead doesn’t necessarily imply a lack of desire for autonomy. In fact, according to research from PsychTests, employees who lack job control at work – being left out of the decision-making process, not being able to control work pace, having no say in the type of projects they take on or how they are completed – can augment and person’s stress level significantly, and increase their likelihood for burnout. 10% of the people in the low job control group have been diagnosed with burnout, while 3% are currently being treated for it (compared to 6% and 1% for the high control group respectively). 92% rated their stress level at work as “high” (compared to 23% for the high control group). 15% have taken more than a month off work as a result of stress (compared to 4% for the high control group). 49% have consulted a professional about a stress-related problem, and 11% are considering doing so (compared to 22% and 3% for the high control group respectively). 75% are dissatisfied with their job (compared to 6% for the high control group). 64% admit that they no longer care about doing their work well, while 84% have lost interest in their tasks and projects (compared to 5% and 9% for the high control group respectively). 62% feel that the magnitude of their workload is preventing them from doing their job well (compared to 4% for the high control group). 84% believe that their boss and/or co-workers expect too much of them (compared to 7% for the high control group). 91% feel emotionally empty at the end of their work day (compared to 12% for the high control group). 88% feel unappreciated at work (compared to 4% for the high control group). 91% admit that just thinking about work makes them feel exhausted (compared to 17% for the high control group). 81% would quit their job today if they could (compared to 14% for the high control group). 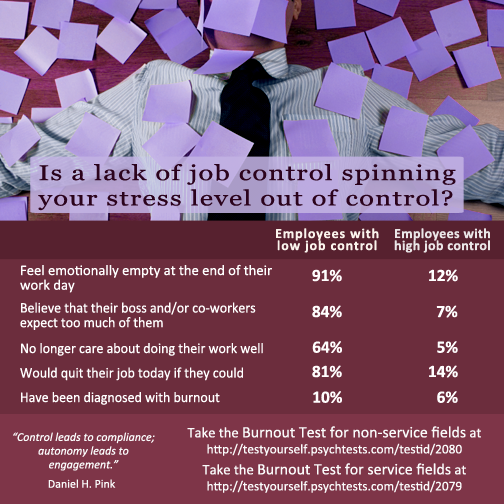 A lack of job control is one of the risk factors correlated with burnout.Compared to employees who enjoy autonomy, those with low job control are at a significant risk for stress and burnout.